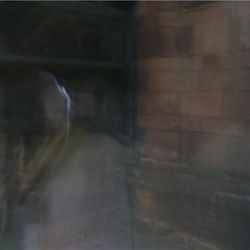 Ghost Walking Tours in Newcastle Upon Tyne UK with Haunted City Tours. Extreme Ghost Walk of Newcastle with Ouija Board! 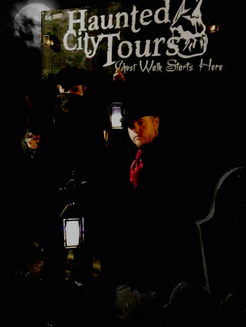 Newcastle upon Tyne’s Ghost Walks by Haunted City Tours since 2007 have been offering a range of historical to haunted guided ghost walk tours of the most spooky and strange haunted places in Newcastle and Durham for a decade, from the haunted Castle Keep and Castle Garth to its outer walls, the Black Gate killing pits and old Graveyards of Newcastle to our ghost walks of the haunted woodland of Jesmond Dene along with the Haunting of Finchale Farm in Durham, to the Plague pits and cobble backstreets of Newcastle with ghostly sightings and real murder sites. We are not just for Halloween but offer ghost walking tours all year round, from spooky Newcastle ghost walks for families to extreme Ouija board Ghost Walks for adults only along with our ghastly pub walks, Victorian Ghost Walks. We also offer the only official Plague Ghost Walk outside of London. We offer the best nights of haunted entertainment. Newcastle is one of the UK’s oldest cities with its dark legends of ghostly headless horsemen, serial killers such as the Dean Street Strangler, the Newcastle witchcraft trials of 1649, human sacrifice to the real brutality of the Newcastle civil war and grisly executions, the Black Death of 1636. This ancient city offers the best backdrops for such ghastly encounters with its bygone murderers of its violent past through our stories and old buildings that still stand and play part in our stories and form the backdrop for many a haunting from Newcastle Castle Keep and Black Gate along with its dungeons, Tudor houses where plague families were locked up and died to old pubs and sites of real history. 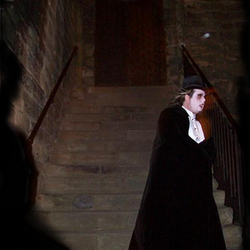 Newcastle upon Tyne and Durham's Haunted City Tours take you on an entertaining journey back in time and turns the city's haunted history into dark tourism, catering haunted themed events and guided ghost walks in Newcastle and Durham for private tours, corporate events, birthdays and specialist events along with school trips. We have been scaring people for over a decade, over 50.000 people can't be wrong! With the use of adult humour we delve into the blood-curdling ghostly parts of Newcastle's evil history. Learn the torturous methods used by unscrupulous characters to the grisly details of our most prolific killers who haunt old Newcastle. With the use of ghost hunting tools we will try and contact the spirit of a young girl who haunts one of our sites. 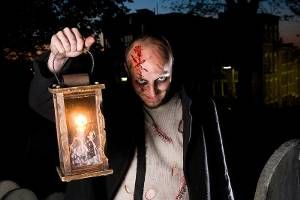 The ghost walk offers visitors a thrill like no other attraction in Newcastle and has had over 600 people who have come forward to say they had things happen during the tours, from scratches. Click here for more information. The Haunting of Finchael Farm and its woodlands have been told to generation after generation. Stories of dark monks that vanish down woodland walks, a lady that haunts the old farm where poltergeist activity is rife. Spectral figures that float through the old ruins, ghostly shadows and phantom footsteps await you at the Haunting of Finchale Farm in County Durham. Visit the old barn where workers have had tools vanish for them to re-appear at random locations and even had them thrown around, an old man has been seen standing in the back of the barn only to vanish when approached, see the sites where phantom Monks are said to haunt along with an evil presence that’s said to haunted the woodlands and farm grounds. 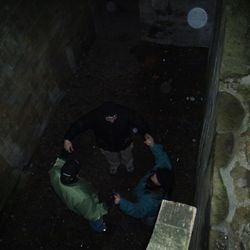 The tour concludes in the old stores and dungeon where a group of kids were attacked in the 1980's while taking part in a séance and Ouija board. Hear from the workers themselves along with your full costume guide. This lamp lit ghost walk of the old farm grounds, ancient ruin and barns will scare you beyond death. 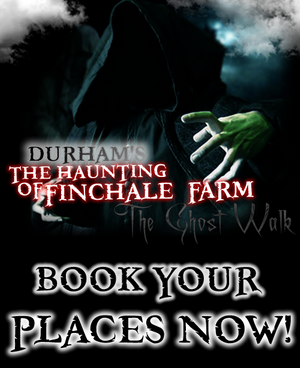 This tour is led by a ghostly monk and is very dark and i The Haunting of Finchale Farm and its woodlands have been told to generation after generation. Stories of dark monks that vanish down woodland walks, a lady that haunts the old farm where poltergeist activity is rife. Spectral figures that float through the old ruins, ghostly shadows and phantom footsteps await you at the Haunting of Finchale Farm in County Durham. Our very scary and super creepy Victorian based ghost walk, Children of the Grave which is a sinister haunted historical tour about Newcastle dark past connected to child slave labour, tragic stories and many haunting's related to the Children of the Grave. A brand new tour that launching our new book called Newcastle's 13. It's a tour that starts from the Royal Station Hotel by Central station and takes in 13 haunted sites where you're almost guaranteed to meet the dead. This dark tour of the city will bring to life its most haunted and iconic locations giving people first hand encounters with the dead. It features ghostly photos, real EVP recordings and even ghostly footage replayed back via our ghost walk guide multi media devices. A brand new DEAD Silent, a tour that takes place when the city is the most quiet, here you will hopefully witness the phantom sounds of mystery laughter, footsteps that follow and stones been throw, all sounds that are normal drowned out by the hustle bustle of the city. DEAD Silent takes place around the Castle Garth of Newcastle taking the dark historical and medieval locations with creepy paranormal experiments. Revamped on this tour we bring you face to face with the deadly pestilence that killed almost half of Newcastle and devastated the world. Your tour guide, our sinister Plague Doctor will guide you by lamp light through the old cobbles and haunted walkways where the plague victims are buried in mass plague pits, see the burial grounds where hundreds are buried but not at rest. Howling shrieks, banging doors, fowl smells and phantom dark figures await you at the many haunted plague site of Newcastle upon Tyne. Our unique ghost walk and the only walk like it OUTSIDE of London takes you on a fascinating, ghastly journey through old Newcastle’s haunted plague streets and graveyards. Check out our new show on our NEW YouTube with one of your favorite guides and writers and radio hosts Steven J Taylor from Alone In The Dark Entertainment as he checks out abandoned haunted buildings to the most haunted sites in the UK. He records himself sleeping in haunted buildings to 3am challenges and much more. Why not subscribe NOW for new videos! Steven J Taylor started the Newcastle Ghost walks a decade ago in Newcastle and this Halloween 2017 marks ten years of ghost walking tours in Newcastle upon Tyne. 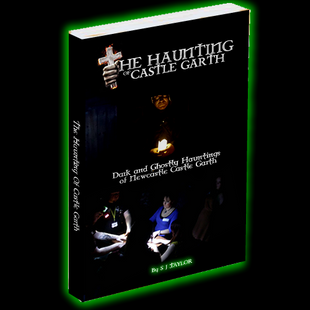 Steve has written a special E-book that will only be on sale for a limited time only and gives all the lesser known ghost stories of Newcastle Castle Garth along with real ghost photos and real life experiences from the past ten years. Steve brings to life the haunting's he has witnessed along with the dark history of a fascinating haunted city. It's the ideal bedtime read. It's only £4.99 and on sale NOW! The brand NEW E-book by Steven J Taylor is now available. 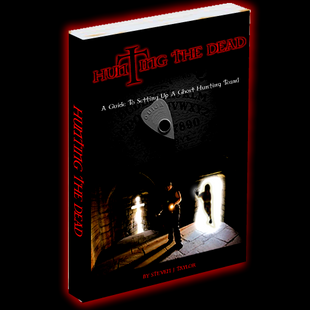 Hunting The Dead A Guide To Setting Up A Ghost Hunting Team. This new E-book gives all the information needed to setup a ghost hunting team, club or unit for paranormal investigation. Hunting The Dead goes through step by step how to information giving the best advice from over 20 years of paranormal investigation, from setting up teams for hobby based groups to profit making teams. 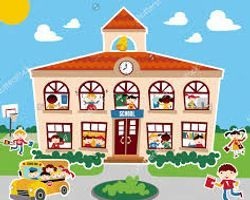 It looks at everything from logos to insurance, finding team members to hiring haunted locations along with what's the best tools to buy and use plus so much more. This E-book is the only book you will ever need to buy to set up a team for success in the ghost hunting world. 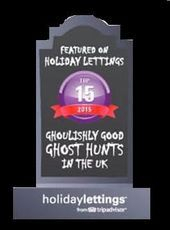 It's ideal for anyone from hobby based to professional ghost hunters. It's only £4.99 and on sale NOW! Other Ghost Walking Tours in Newcastle and Durham! Call us today for more information on school bookings and trips in Newcastle and Durham with our dark history guides. From Victorian criminals to witches, monks and plague doctors! What ever you are teaching we can bring it to life on our dark history tours! 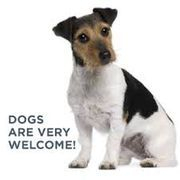 Our Ghost Walks are Dog Friendly! Visiting Newcastle? Private, Corporate & Team Night Out are available along with day trips and evenings for all groups! Visiting Newcastle on a day trip or evening then why not book a Haunted City Tour? Book now for your corporate and team building nights out, what ever the occasion from just wanting to do something different and spooky to using the tours as part of your hen night in Newcastle, maybe you want to raise money for charity, a haunted ghost walk is a fantastic way to raise the cash. Are you visiting Newcastle on a ghost hunt? Why not book one of our tours and gather as much info on the paranormal side of old Newcastle upon Tyne. 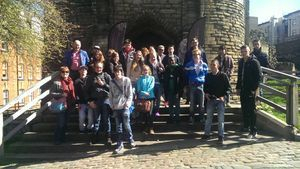 We take all kinds of groups from schools on day trips to scouts and LGBT to motorcycle clubs, surf clubs and football, rugby clubs or whoever is visiting the area of Newcastle or living close by should definitely find out more about group discounts. 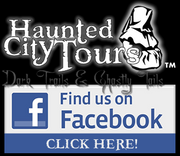 Email Haunted City Tours NOW! Can't see a date that suits you? Have more than 10 friends wanting a tour? Get in touch as we can book you a private tour! 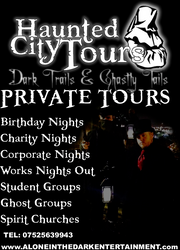 Private tours are available on ANY tour we currently advertise! 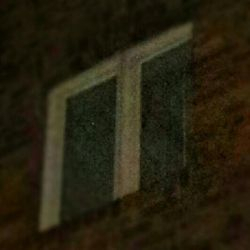 Your Ghost & Paranormal Attack Photos! A strange orb in the Black Gate killing pit. 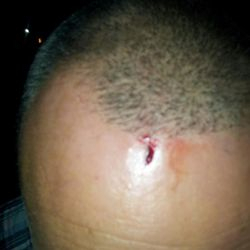 Ghost walker hit by a sharp object when he was alone in aempty area. Ghostly fog caught where the white lady haunts! 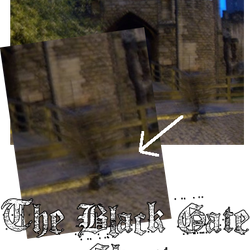 Ghostly faint figures lurk in the Blackgate entry. 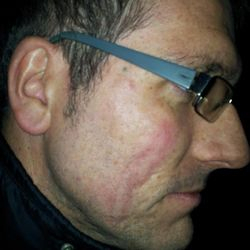 Ghost walker scratched down his face by a demonic spirit on the ghost walks. He also heard a hissing and felt sick. 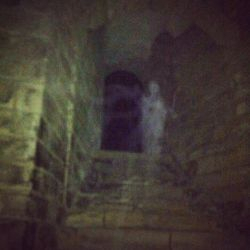 A ghost of what some think could be a women who haunts the castle. 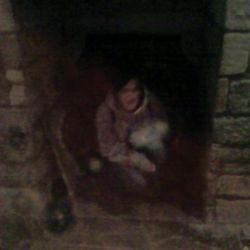 This photo was taken by 3 off duty police officors on a works ghost walking tour! A strange orb of light above the tour guides head on one of our private family tours. 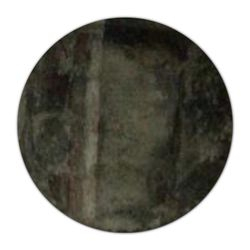 Ghostly figures stand behind the wall, some say they can see a roman with a shield and a hooded figure in fron of him. 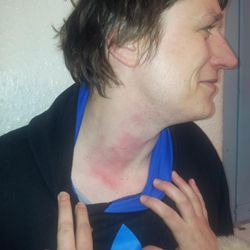 Ghost walker felt like something had its hands around her neck, these are the marks! 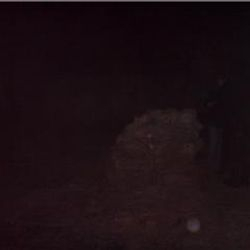 Rob a good customer and his ghostly orb at the Blackgate. Photo by Robs mate. 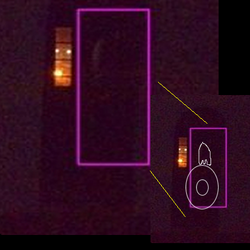 What we think could be a ghost of a sailor in the graveyard o! 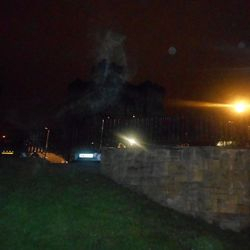 Ghostly photos taken by you guys the ghost walkers on the Newcastle Haunted City Tours along with your ghost attack photos from our EXTREME tours. Have you attended a ghost walking tour in Newcastle with former Newcastle Ghost Walks that's now known as Newcastle's Haunted City Tours? Have you been attacked? Do you have photo or video?